An opening flashback details the early days of Superman and Lois Lane on Earth 0. Lois works from home, raising young Jonathan, while Superman averts disasters and easily defeats would be super-villains. The story flashes to the present, where the Excalibur has been found, and is being inspected by the military. The situation is curious, as examination proves that the ship was inhabited, but there is no one to be found at the crash-site. Lois retrieves Jon from school and further trouble, but is followed by men seeking to do ill-intent. Lois alerts Superman, who arrives and puts a stop to the men, then performs a top clean-up, before returning to discuss the situation with Lois at home. We're shown in an epilogue that Hank Henshaw is alive, and being held unconscious of his whereabouts, while in a galaxy far away, someone described only as "mistress" learns that the "Oblivion Stone" she seeks was taken to the sol system. 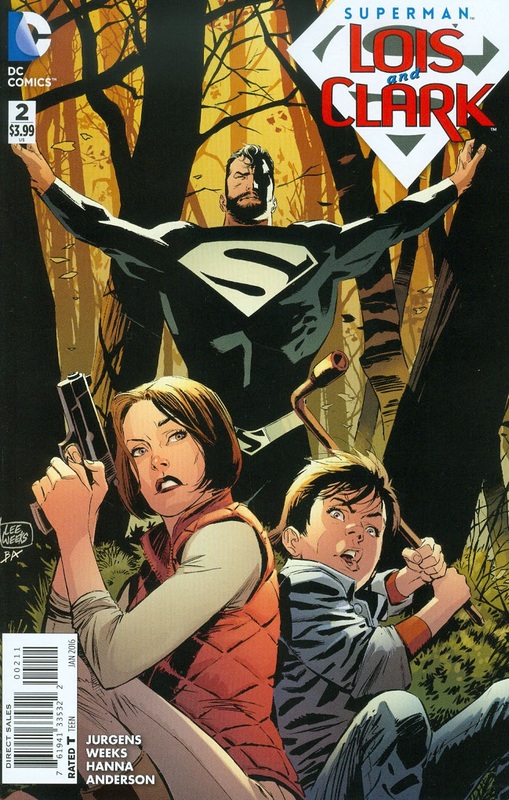 Story - 4: There's good news and bad news regarding Superman: Lois and Clark. The good is everything that this issue had to offer, and with such ease. Jurgens shows that it isn't that hard to write a good Superman story, but, then again, Jurgens has had a decade or more experience writing Superman, as opposed to a mandated poseur, who also fell flat under his pen. There are no less than six plot-lines being offered here, a feat that hasn't been matched since the much derided Scott Lobdell. Jurgens continues to fill-in the reader on the much needed to know past events of Superman and Lois' arrival, while losing no force when shifting to present day events. No character is left without development, and the flow is natural, organic, and thoroughly satisfying. Some doubted the gravitas of this series, slating it as nostalgia or bemoaning Superman being married with a son. Jurgens reminds us of the great complexity to be drawn from marriage, from children, and from characters that are well-rounded, rather than being ground into angst, brooding, and flat-out self-loathing. However, the most surprising beneficiary of Jurgens' crafting, is Jonathan Samuel Kent. Children draw much derision when added into the mix of most stories. They're either introduced as a new character foil for established players who've been rightly fleshed-out, and are either "nauseatingly wholesome" or precocious pains. Few writers address children with the layered nature that childhood brings to them. In Jon, Jurgens shows a nine-year old who is a budding gestalt that the reader will anticipate much from. Mischievous, aggressive, intelligent, and courageous, Jon defies the trope that would be the bane of most characters his age, without going the pseudo-evil route a la Damian Wayne. He is the voice and eyes of the reader, keeping both Lois and Clark honest, in a situation that calls for secrecy. There's every chance that Jurgens may slip in this top, thus far, approach, and leave us with Spy Kids, as opposed to what he's been developing, but that doesn't appear to be the case. Instead, we're probably being treated to a Jon who's probably holding his own set of card close to the vest, waiting to reveal them to his parents, who are busy shielding him. The wake of destruction that New 52 Superman has left behind him, makes the seamless manner in which Superman dispatches the villains, cleans up, and makes off, almost surprising. Jurgens holds true to how Lois and Clark needed to remain hidden, and in watching Superman remove the Intergang players one-by-one, quickly and quietly, is a nearly jarring experience when juxtaposed with that other lad's events in those other books. Superman, here, is polished, poised, and perfectly attuned to what needs to be executed. In all honesty, this issue could easily be placed within the Bronze Age of Superman comics, the period of the character's greatest development, which is no small praise from this reviewer. It's a reminder of where Superman was ultimately heading before being derailed with reboots and poorly executed ideas like WONK and "Grounded". The good news doesn't come without the bad, however, and that is, from what I've read, Superman: Lois and Clark is only to be 12 issues. That is not an appealing notion, as with the book's completion, there's little left to fill the void except a pretender to the throne. What's more, are these the last issues of Superman, the fully formed hero? Are these the last instances of Lois Lane, portrayed in a manner befitting both her history and following? What in the world becomes of Jon Samuel Kent? Death? Oblivion? It will be interesting to see what becomes of the true Man of Tomorrow, and if for any reason this is his last adventure, then DC, who has admitted neglecting their core audience, has learned less than nothing these last few years. That being said, Earth 0 just doesn't seem configured for more than one Superman, and that's by design. It's far enough in the future to be not be a pressing matter, but in my mind, sadly, it's already been played out. Art - 4: Lee Weeks turns in another solid issue of rendering. The only drawback is that for talent like weeks, there really isn't enough of a punch for his pencils. The story is solid enough, but it doesn't really call for anything dynamic on Weeks' part, which we can only hope changes with future issues. Cover Art - 2: A bland and unrepresentative cover, especially with all of the goodies to be had inside.